Welcome to the AM Power Yoga Old street London studio! We offer close to 200 classes a month ranging from relaxing yin to fast paced high intensity yoga and bootcamp yoga. Whatever your fitness level or goals, we have a class for you! Our beautiful studio in Shoreditch, London is just 5 mins walk to old street station and a 10 mins walk to Barbican. Our large studio can accommodate upto 40 students. We offer complimentary mats and have lockers and shower rooms. Most of our classes are heated to 26-28 degrees, which makes the room warm (but not uncomfortably hot). The temperature is considered optimal for stretching the muscles for a power or vinyasa yoga workout. 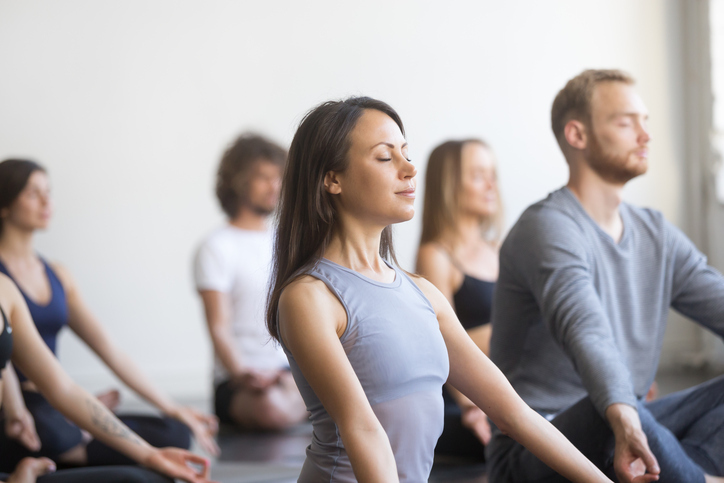 At AM Power Yoga, we believe that Yoga should be for everyone. Thats why we aim to provide a variety of classes that can suit every fitness level, every goal and every time schedule. Hence we start early in the morning for those we want to get a workout before work, and finish late in the evening for people coming after work. How to choose the right class for you? Every class indicates the level – so All Levels means its for all levels whether you are a beginner or seasoned practitioner, while Level 2 means that the class is intermediate level. In a All Level class, the teacher would typically offer variations of poses – both an easy one for beginners as well as a more challenging one for regular practitioners.